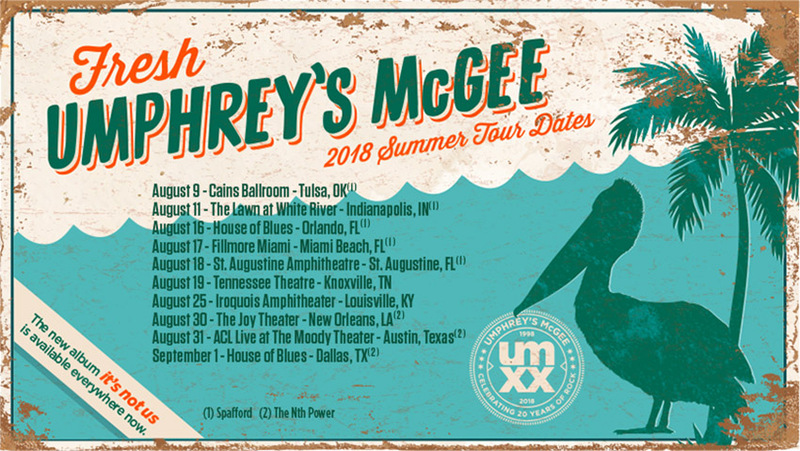 Umphrey’s McGee is pleased to announce a fresh batch of tour dates to round out summer 2018. After the tour opener at Cain’s Ballroom in Tulsa, and a return to one of our homes away from home at White River State Park in Indianapolis, we’ll be heading southbound this August with stops in Orlando, Miami Beach, St. Augustine, and Knoxville. Following rockin’ at Lockn’, we will hit The Iroquois Amphitheater in Louisville, Kentucky on August 25. We welcome special guests Spafford to help us kick off the run for five summer shows, and The Nth Power featuring The Spirit Horns (Jen Hartswick and James Casey of Trey Anastasio Band), who will finish up the tour with us in New Orleans, our debut at ACL Live at the Moody Theater in Austin, and Dallas. A ticket pre-sale will take place Wednesday, March 28th at 10:00 am ET through Umphrey’s Ticketing, with public on-sale beginning Friday, March 30th at 10:00 am ET. Hit the road for some rock & roll with Umphrey’s McGee this summer.